Picture this: your company has exciting news to share with customers, shareholders, suppliers and your target market. 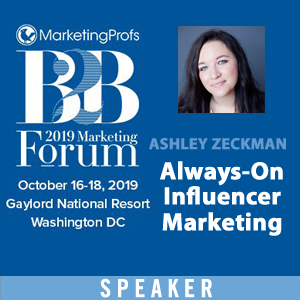 You’re launching a new product this week and it will be debuted at a popular industry event, sure to be attended by media, influencers and people who will want to buy YOUR product, just as soon as they learn about it. You craft the perfect press release and send it to 1,000 of your contacts. Twenty of these people think this is such great news, they each send it to 500 of their friends, relatives and business contacts. Five of those people pass the news on to 250 of their contacts. Of course, these people are all fascinated, as you’ve been able to include pictures, a video, and they all received the message within hours! Sorry, this type of viral messaging just doesn’t happen in real life… outside of Facebook, that is. Facebook is fast becoming one of the most powerful PR tools on the web. Using Facebook as an online PR tool allows companies to increase their reach exponentially, getting in front of interested people with engaging content when and where they are receptive to the message. A recent comScore study, The Power of Like 2: How Social Media Marketing Works, found that earned media exposure through Facebook amplification increases sales both online and in-store. 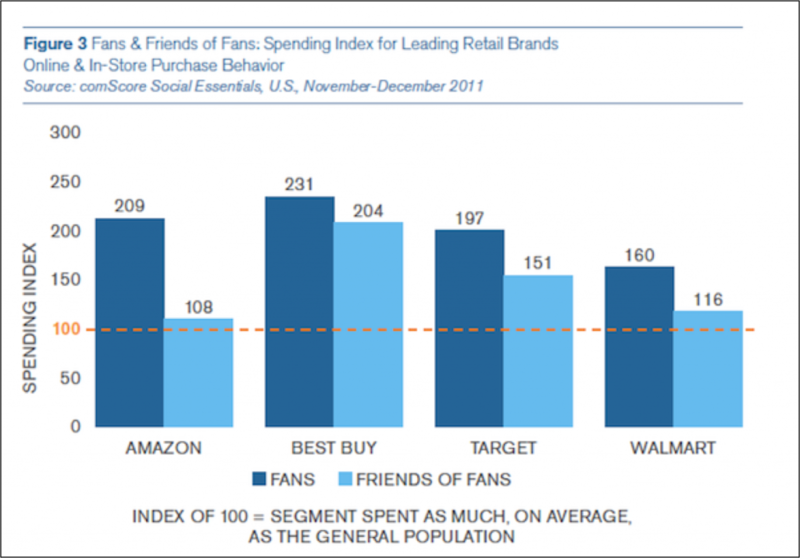 Fans of brands spend more, but so do their friends, thanks to the viral nature of Facebook and the ability to more widely disseminate brand messages. How often can you talk about margarine on Facebook and keep the interest of your fans? Country Crock has the perfect solution for brands with a highly niche product: don’t talk about your brand at all. Talk about the problem your product solves. Country Crock has an incredible 677,000 Facebook fans, with hundreds at a time sharing their content and generating conversation around the company’s Page. This is the best kind of online PR possible; their fans are advocates of the brand and regularly circulate Country Crock content. This puts the brand’s name and logo in front of a network of thousands of fans’ family and friends. They encourage social sharing by asking questions of fans, including a call to action in their posts (Share this if you agree! ), and sharing delicious recipes for Moms who don’t have time to scour the web looking for simple dinner ideas. Doing so consistently has made Country Crock’s Facebook page “the” place for their fans to find recipes and get inspired. 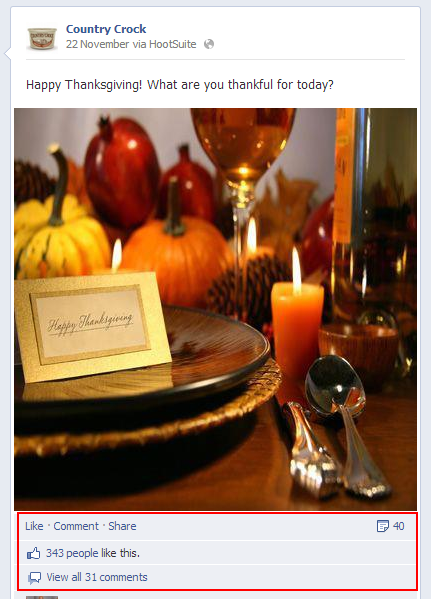 Facebook PR Pro Tip: Don’t expect fans to share your company’s advertising or PR messages. Deliver great content and they will share your content, putting your name, logo and messaging in front of their network of friends. 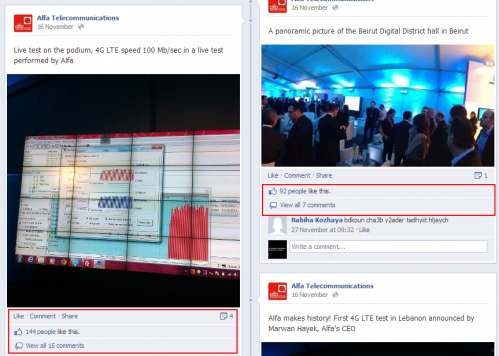 Alfa Telecommunications, Orascom Telecom Media & Technology’s mobile network brand, have amassed over 89,000 Facebook fans and see an impressive level of engagement on nearly every piece of company news they share. They are skilled in maximizing their ROI from industry and company events by sharing high quality, interesting photos and videos with Facebook fans. The metrics shown above seem to be about average for Alfa; hundreds of people Like and several more comment on and share their visual content. This is fantastic for them, as this expanded reach is putting their company in front of friends of fans who may not have connected with the brand. 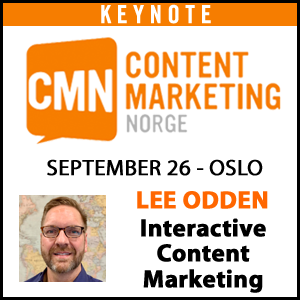 Their content mix is kept interesting and fresh with industry news, fun facts and statistics, and information of general interest to people in their geographic region. This means that when they have company news to share, they can do so without fans feeling as though they are constantly the subject of a marketing campaign. Facebook PR Pro Tip: Use high quality multimedia content on Facebook to increase social sharing and expand the reach of your PR campaigns. 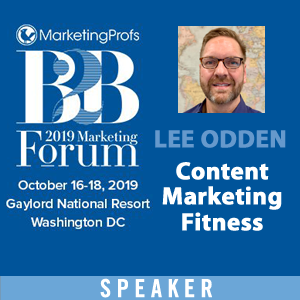 For more great tips on event marketing using SEO and social media, be sure to check out Lee Odden’s Tasty Ideas to Maximize Online Marketing for Events. 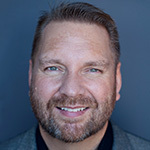 iConstituent’s success story flies in the face of a perpetual Facebook marketing myth: that Facebook users don’t want to be bothered by business or political messaging while using a social network. Who wants to chat with an elected official in their social time? A lot of people, as it turns out. The legislative e-communications agency strives to reach constituents in their Congressional districts and deliver timely, important messages about issues in their districts. In one structured test campaign, they saw engagement on elected officials’ Pages increase 300% after running Facebook Ads and had 10 times the ROI, compared to a traditional, glossy paper mailer. Ad creative typically included an eye-catching photo or logo; a few past examples included a graphic that said “JOBS,” or “I want to hear from you.” iConstituent deployed ZIP Code targeting for the Congressional district, with precise interest and hashtag targeting to bring in relevant constituents. Once constituents are pointed to and enticed to Like the elected official’s Facebook Page, PR is incorporated into their content mix. They are then able to connect and engage with constituents regularly, ensuring the people most receptive to their news are receiving it via the Facebook platform. Facebook PR Pro Tip: Use the tools available to you to build a targeted audience, highly receptive to subsequent organic PR messages. 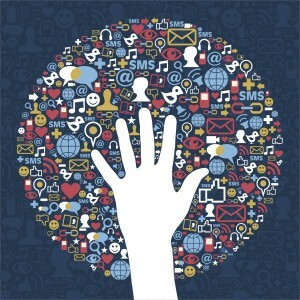 Are you using Facebook as a facet of your online PR strategy? Share your best tips and success stories in with other readers in the comments! Thanks Ashley 🙂 It’s actually super easy to find companies doing great things on Facebook, the hardest part is deciding which ones to feature lol. I liked these 3 because they aren’t your typical businesses; they each have a real challenge and have been creative in coming up with a strategy that works for their audience. sharing.I got a lot of ideas from your post. Last time it use to be shouting the loudest. Now is more of how your brand can solve a problem. I agree with what you wrote on sharing unique content that add value to the target market. Let the power of word of mouth do the work. You craft a good content that gives value to your target audience, they share it out for you. 🙂 great post. I remember that study, Lucky! Thanks for sharing, Buddy Media do come up with some great industry-wide insights.